Kelly Lehr Members of the undefeated Synergy team play Henderson's Heavy Hitters in Boulder City Parks and Recreation Department's women's volleyball league. The double-elimination tournament begins Monday. 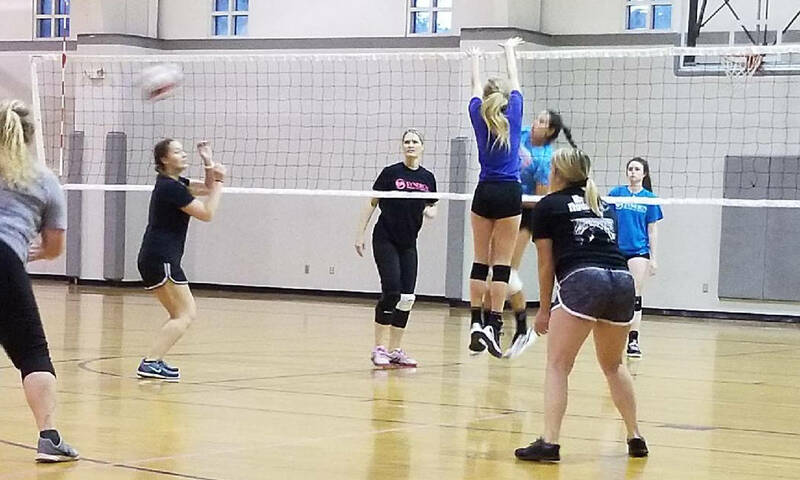 The Boulder City Parks and Recreation Department’s adult women’s volleyball league begins tournament play next week with Synergy leading the division with a 12-0 record, followed closely by last season’s champions, Volleygirls (10-2), and Henderson’s Heavy Hitters (8-4), according to Kelly Lehr, sports coordinator for the department. Games will begin at 6:30 p.m. Monday, May 7, for the double-elimination tournament. It will conclude at 9 p.m. May 14. Women’s volleyball has two leagues during the year. The next league for the fall season will begin in September and run through November. Adult coed softball is in full swing at the Hemenway ballfields on Sunday evenings. T.Q. Pallets is on top of the standings, followed by Boulder Dam Brewery and Lakefront Pool and Contracting (both 5-3). Boulder Dam Credit Union and Adam’s Team (3-5) are tied for fourth place, with The Backstop close behind (1-7). Coed softball games are played through early July. The league will conclude with a daylong, double-elimination tournament. Coed softball has two seasons a year, with the next league beginning play in mid-September. Call Kelly Lehr, sports coordinator, if you are interested in joining the league. Her number is 702-293-9254. The opening ceremonies for the department’s T-ball, coach pitch, softball and baseball leagues will begin at 5:30 p.m. May 10. Mayor Rod Woodbury is expected to welcome families to Veterans’ Memorial Park’s Pratte Field. He will be accompanied by guest speakers who are members of UNLV’s baseball team. The teams will be donning their new uniforms and thanking their sponsors as they parade around the field at the conclusion of the ceremony. The fields will be open for the first games of the season at 6 p.m. Baseball season continues through mid-June with games being played at Pratte Field and the Hemenway ballfields Monday through Thursday.